The government is essentially paying families hush money to make them more complacent to what's happening here. Are they seriously trying to buy public opinion? Here's the deal, folks. I want to go back to work. I didn't become a teacher for the summer break, and although I'm certainly not complaining about the time in lieu that I receive for my overtime hours throughout the year, the fact remains that I don't deal well with downtime. So, aside from the yearly "Everyone walks out of class while I'm talking" nightmares in the last few nights of summer break, I don't dread the start of school. At all. But I'm dreading it this year. Because I don't know when it will happen. And if Thursday's announcement by B.C. Finance Minister Mike de Jong is any indication, the Liberals don't give a hoot when that is. B.C. parents will receive $40 per day per child under the age 13 if schools are not open in September. If an elementary school has 150 students, that's about $6,000 a day. Per school. There are over 100 elementary schools in my district. How is this a fiscally responsible decision? Not every child in that age bracket goes to daycare. Yet it seems that all parents will receive the money. The government is essentially paying families hush money to make them more complacent to what's happening here. Are they seriously trying to buy public opinion? B.C. doesn't have a universal provincial daycare system. Yet now they're giving out money for child care. Does this mean that they're viewing the education system as little more than a place for workers to ship their kids off to so they can go out and earn wages to be taxed? The $40 per day will be paid by savings from the teachers' strike. Oh, awesome! Instead of putting money into the education system, they're taking the wages that we've forfeited as a desperate measure to show the government that our schools are in crisis and they're putting them into private hands. And I totally get that child care is an issue when we're on strike. I'm sympathetic to that, really. But this $40 is a Band-Aid solution. Handing out a stipend for a temporary disruption does nothing to solve the reasons that we're on strike in the first place. This is tantamount to saying that inconvenienced parents are more important than B.C. kids' education. And, I'm sorry, but they're not. De Jong says that if there is no deal with teachers by September, the B.C. Teachers' Federation will lose any hope of receiving strike savings, reported Global News. Even better! We've been given an ultimatum. There are millions of dollars worth of unspent money earmarked for education as a result of this strike. Millions. And students are the only people who would suffer from those funds being diverted to other areas. It's not like we get back pay once the strike ends. The only way that teachers would ever see evidence of their lost pay is if it walked into their school as a counsellor, librarian, SEA, ELL specialist etc. You know, things that we're literally standing on street corners to beg for. Yet the government is threatening to take this money from the kids if we don't sign a deal by September. If that's not a threat, or blackmail, or a plain guilt trip, I don't know what is. We want them to put that money back into the education system. It wouldn't go to the BCTF -- it would go to the things the BCTF is fighting for. Which is, put simply, a quality education for BCs kids. Parents will be able to register for the subsidy through a website set up by the provincial government. And how much is it going to cost to run this? Website developers, customer service folks, office admin, consultants, whoever else is deemed necessary. This isn't free. But apparently it's more important than actually funding education. Which makes no sense to me at all. So, yeah, I'm pissed. And I won't hide it. Nor will I choose better language that the word "pissed" -- even if it might not be very "teacher-like" of me. Because you know what? I'm not just a teacher. I'm a person. I was Ashley before I was Ms. MacKenzie. And she hasn't gone anywhere. But she's livid. Because your kids are worth more than $40 a day in hush money. They're worth an education system that can help them become the best them they can be. So, I'd love to go back to work. Soon. 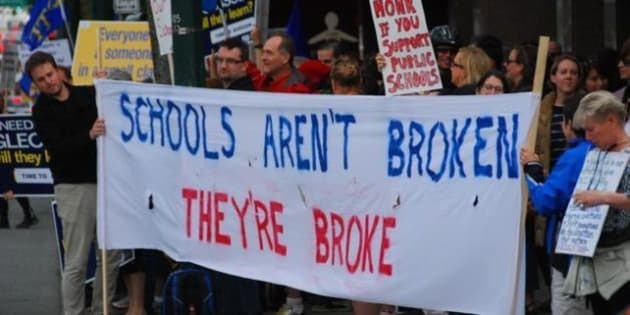 But not when my government is trying to guilt teachers into going back to a system that doesn't respect students or teachers while simultaneously trying to buy off parents.